At Platinum House, we used a minimalist design aesthetic to create an other-wordly, ethereal wonderland that transported Platinum House guests to land reachable only through their dreams. Our way-finding and entrance to Platinum House teased what guests would see throughout the experience. This included materials like crystals and scaffolding; artistic effects like ombre; and 3-D hedges. To connect the space, we had a literal ribbon tie everything together. An abstract representation of a new brand design element, our ribbon started as a branded photo opp in front of Snarkitecture Mountain. Then it undulated throughout the experience—coming up through the ground, over the structures, weaving around and through scaffolding, and down back into the ground. Like a peaceful breeze, it helped relax hard edges and bring cool to the Southern California heat. We also continued the scaffolding from the entrance hedge throughout the space. 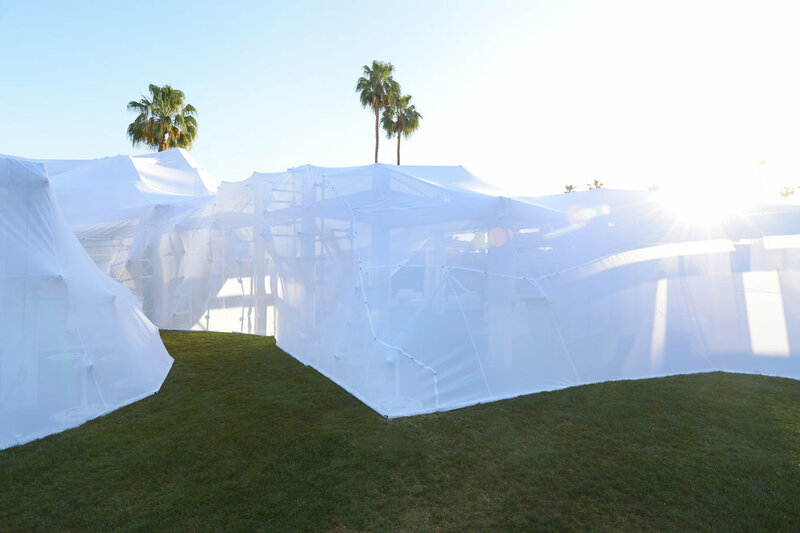 Inspired by the landscape of Palm Springs, the Platinum Mountain structure and space was created to reimagine the San Jacinto Mountains that can be seen in the distance. In order to connect the two lawns where Platinum House lived, utilizing mirrors, the waterfall feature appeared to be flowing over the hedge from the Platinum Mountain structure. We offered thoughtful, visually appealing programming from sunup to sundown curated in collaboration with Platinum partners. Mornings consisted of sweat sessions at the first-ever pop-up of SoulAnnex— SoulCycle’s off-the-bike fitness experience. Afternoon programming included complimentary food and drink, on-trend reclined makeup applications by MILK Makeup; express Crystal Reading & Reiki Healings by House of Intuition; spring-trend-inspired Tattly tattoos curated by Saks Fifth Avenue; and live music performances by Republic Records with artists. Platinum House this year was also ‘shoppable’—allowing guests to purchase items from the “This is Just Fantasy” capsule collection by Knowlita and Monday Swimwear. We had illusions that elevated the space in a natural way. Our “Transformation Tunnel” repurposed the existing Jonathan Adler tile, warping it, to create the illusion that guests were walking through a tiled and trance-like state into a Wonderland on the other side. 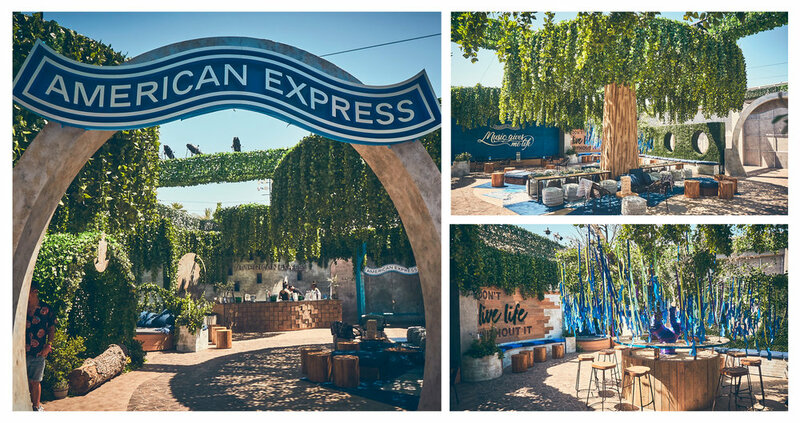 On the Coachella grounds, we turned sun blasted concrete into an exclusive lush secret garden for American Express Card Members. Once inside the space, Card Members were greeted with experiences that awaken the senses, refreshed the soul, pleasured the palate, and indulged in a playful spirit. Leafy greens and luxurious lounge areas provided refuge from the fierceness of the festival, but also surprised guests with organic photo moments. Throughout the design of the Secret Garden, we executed thoughtful ways to integrate the brand’s visual identity. We gave the space a natural modern aesthetic rooted in a neutral organic palette while finding harmony in pops of white, brand blues, and grey. Nature was interpreted in interesting ways, greenery felt current and shapes felt minimally industrial and slightly rustic. The lounge was made up of modern-meets eclectic pieces, with a balance of unfinished wood, denim, canvas and textiles.